kools tools: the initial thrust off of a low or high before a meaning ful retrace gives the price projection, a point of support or resistance. that IS interesting...not sure why! (the ten point numbers). fwiw... first touch of my 912.75 gave 4 handles , this one probably near the same ,but i really feel were going to see 917.50-918.50 ... time will tell! 2nd day in a row closing ticks over 800! a decline (into the 22nd?) would seem to be a real danger here. i will definitly try selling that 917-18 zone. Why? when ive constantly been longer term bullish to 980-1025? because, in terms of time , it still seems too soon to me ! any way we shall see! projections down to 909.00, could go a bit lower.... just covered my latest short scalp from 912.50!... 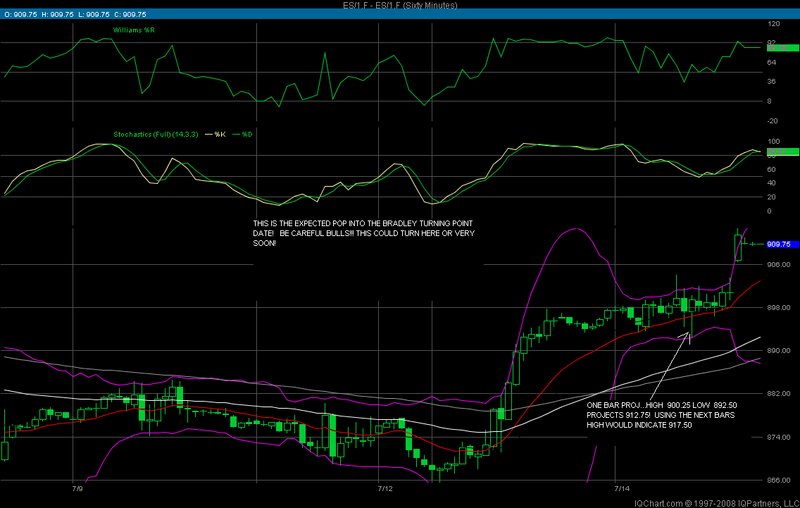 may consider buying 908or 9 for the ride up , but like u Bruce ,i really have my short blinders on at 917.50or above!!! !